On Wednesday morning Paul Rosales (Rosey) coordinated a group photo of all RV pilots at 8:30am. What a sharp lookin' group! It was nice to finally see the RivetBangers.com photographer, "Painless" working. He's been slacking on his job to earn his media pass! Before the masses arrived today I wanted to tour Aeroshell Square to check out the C-5M Super Galaxy. The Stemme S1- caught by eye. It's a motorglider, but where is the prop?? Pretty slick! The prop automatically collapses...and if I recall correctly, it is a variable pitch propeller to boot! It is powered by a Rotax 914 located behind the cockpit, with a solid driveshaft. The prop practically disappears. This has to be one of the slickest things I saw at Oshkosh this year. In my last 3 years at Oshkosh, the beautiful angles of Heavens Landing always begrudgingly allow me to take a picture with them. I'm sure it's only because I have a Media pass. Recently they partnered with a resort in the Exuma's, hence the mermaid. Next up was a seminar put on by Superior on the proper way to do a compression check. This class was top notch and debunked a lot of myths about what is considered a bad compression test. The presentation went into what to look for on the top of the valves with a borescope. Very interesting facts on how rings work to expand when combustion occurs. I'm sure Chad tries to hide when he sees me coming a mile away trying to seek out any freebies. Luckily for Chad, this was just a friendly visit -- I already have an entire wardrobe of Vertical Power attire from previous Oshkosh and Sun 'n Fun encounters! Matt Tisdale's amazing AirCam, N331TT. It won a Kit Champion Oshkosh Homebuilt Award. Matt was a super nice guy...even nicer when I told him I was parked one row over and showed him where my beer stash was. My favorite conversion with Matt involved me asking him if he wanted a beer, and without hesitation, in his South Carolina accent accepting with a smirk and a simple "Well, Heck Yeah!". Wednesday late morning brought a little weather to Oshkosh. It was welcome on my behalf to cool things off - thus far I've been roasting all week. It's a big year for the RV-6! The time had come for the annual Wednesday Night RivetBangers.com prime rib dinner at the Black Otter Supper Club. I don't have any idea how long this event has been going on, but I have been a loyal participant for each of the 5 time's I've been to Oshkosh. All of those without ground transportation eagerly met at 4pm to await the Welcome Wagon to take us over to Camp Scholler. Captain John, Brian, Shantel, and Bruce Hill all look excited for what awaits them! This is my first time using this method of transportation at Oshkosh. I can get used to it after all of the walking I've done all week. The Black Otter Supper Club is no joke. Serious place to get a great slab of beef. As the president of RivetBangers.com, I was humbled by my loyal photographer to bow and present me with my first beer - a Spotted Cow of course! Great group of people - Brian, Chantel, Bruce and CJ! Why is CJ in every picture??? CJ, Bob, Ken, Steve, Frank and you're truly. The prices can't be beat at the Otter. 32 oz for $29 or 72oz for $38. On a per-ounce basis, the 72oz is a no-brainer! After CJ getting and complaining about how bad the Clam Chowder was (Really...a yankee from Plymouth complaining about Clam Chowder from WI? What did you expect??? ), the main course was delivered. Ladies and gentleman, the 72oz King Cut! CJ's queen cut looks like a slice of brisket compared to mine! The Steve's also manned up and got some King Cuts. Although, I think they planned better than I did to bring some home. Eric was wise and got the crab legs. Table 3! I think this is the most people we've had at a RivetBangers Black Otter dinner - 25! Painless documents the anticipation of the first bite of perfectly cooked prime rib. About 45 minutes later, he also documents my defeat by the same piece of meat. It was not meant to be tonight. Even the waitress was disappointing in my lackluster performance. I swear she must of had losing odds on me! I settled nicely into a meat comma and we headed south back toward Oshkosh. The trip home we got to see a good portion of the night air show. A couple of us decide to head back to SOS for a beer or so. Well, after nearly 72 oz of steak, I called it an evening pretty quickly. I was planning on flying out the following day, and wasn't going to be a night-owl tonight. As soon as I left SOS, I was greeted by a very proud owner of a foldable electric scooter. He raised the olive branch of peace in the form of the largest flask I have ever seen. 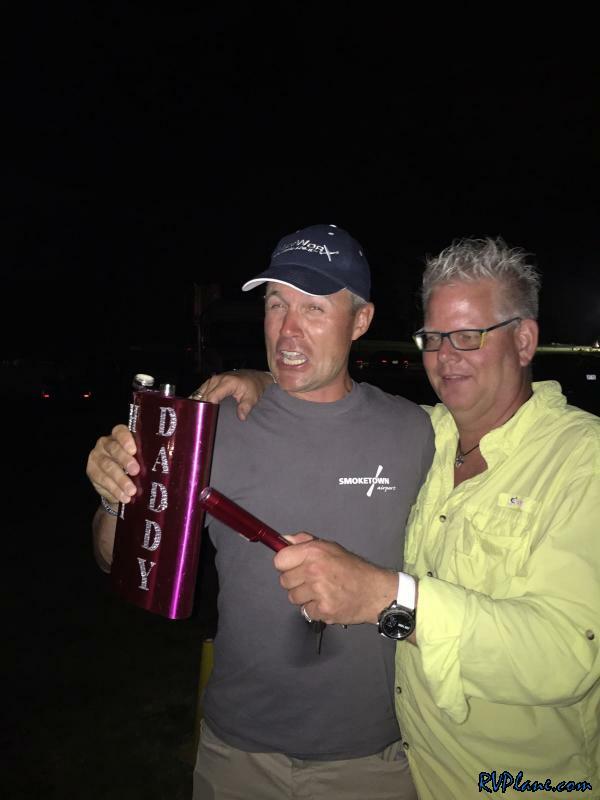 Unfortunately the content of the bedazzled "Big Daddy" flask were not all that tasty! After a quick lesson on how to properly drive the newly acquired electric scooter I performed a series of high speed passes down Waukau Ave. There's a lot more to this story...next time you run into me at a fly in, please ask me for the full story!